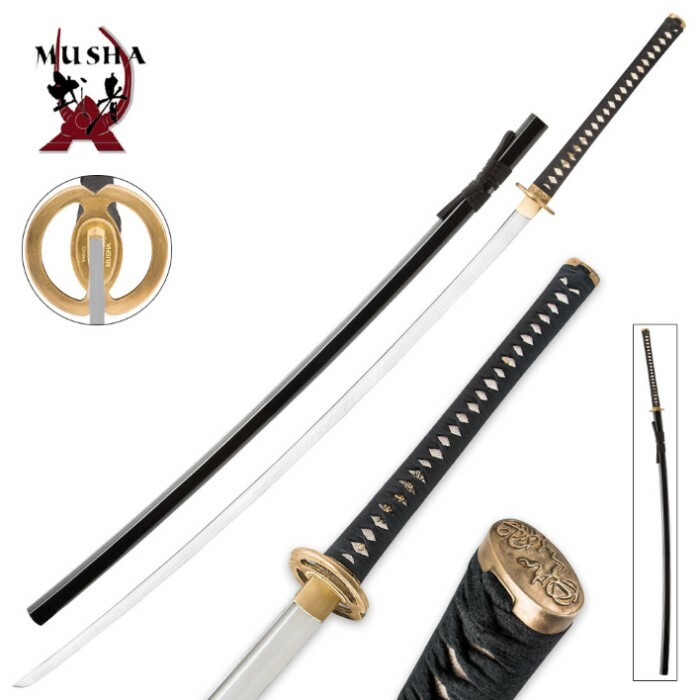 Hand Forged 1045 Carbon Steel Samurai Odachi Sword With Scabbard | BUDK.com - Knives & Swords At The Lowest Prices! 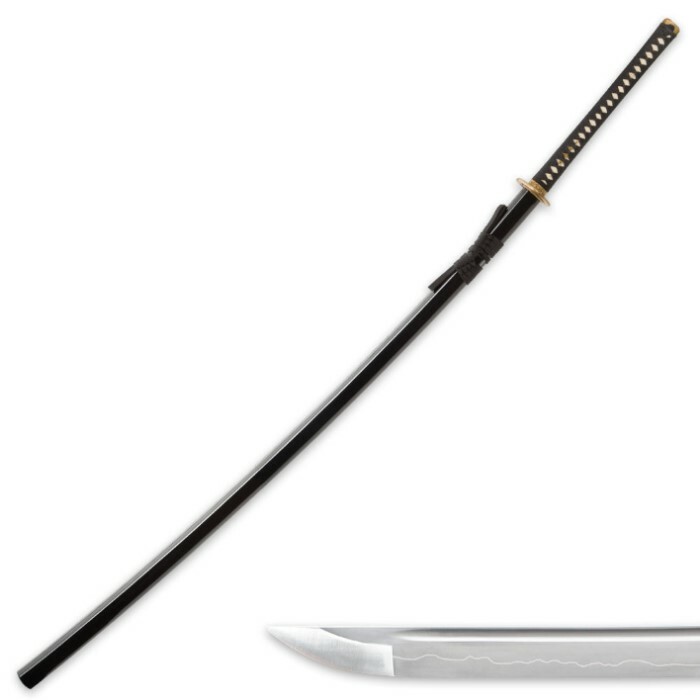 This oversized odachi sword is a must-have for your samurai warrior sword collection. It features durable full-tang construction with a 47" blade that has been hand forged and sharpened just like ancient swords. The genuine ray skin handle is accented with decorative cord wrappings. Authentic embellishments like the copper-tone tsuba, menuki and pommel add even more style. 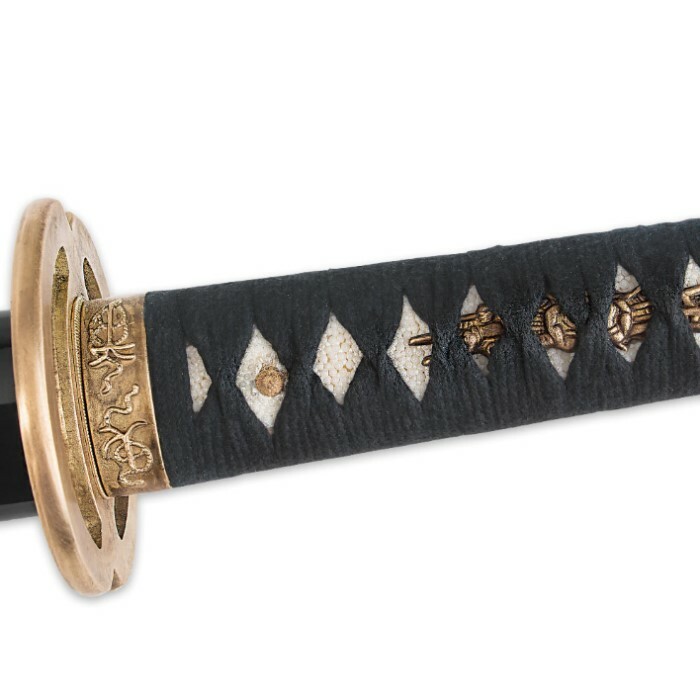 A corresponding hardwood scabbard is included to store this odachi sword in authentic style. I received my Odachi earlier today and was very impressed. The quality is great for the price range! Furniture is tight and it was well oiled, wrapped and boxed. This is a very long sword and very heavy and that comes from a 6'-1" 195 lb man that knows swords. I haven't tested it as yet but it sure looks great on display! Well worth the money at this price! If you want a big sword, this is where to get it. If you want great quality, this is where to get it. The fact that both of these statements can be applied to the same sword is incredible. The ratings don't lie. Swing it however you want. Or display it however you want. This sword is everything a sword should be. Nothing like starting up a conversation with, "Hey check out my sword that can cut through a horse!" If you are going to invest in an odachi, please get one that doesn't bend when you use it. Flex is good, dents and bends are results of poor quality. This is the one to get. Superb reach, good craftsmanship, hard to find a true full tang in an odachi. Would've traded the ornate box it came in for a sharp sword, but a days work on the stone solved that. Beautiful job on the hamon line, full length fuller adds to strength and appearance overall, worth the price . If you want a battle ready longsword, get this one. Of all the swords that I have purchased from True Swords, this is the one that I've wanted the most. I have tried time and time again to buy this sword, but every time I tried, it always went out of stock, and would take forever to re-stock. But now, after waiting for so long, this sword is finally mine. It was well worth the wait because this, right off the bat, is the best sword in my collection. First of all, when standing up, this thing is almost as tall as me. There's a little flex in the blade, only when wabbled around, but that's to be expected from such a long blade. That's not a complaint, I'm just pointing it out. I doubt I'll be bringing down any horses, but with the sharpness of the edge and the length of this weapon, I know people will be scared of me. I might even make the edge even sharper. When this item was re-stocked, I knew not only that I had to have it, but I needed it engraved, so I had my initials put into it. What a beast of a sword. I feel like Sephiroth from Final Fantasy VII with this thing in hand. True Swords, you have seriously done it again. 5 out of 5 is an understatement. I'm giving this a 10 out of 5. IN OCT. OF 2003 MY COMPLETE SWORD AND KNIFE COLLECTION WAS STOLEN . THIS IS THE FIRST SWORD I HAVE BOUGHT SINCE THAT TIME . IT WAS DELIVERED VERY QUICKLY . I WAS VERY IMPRESSED WITH THE QUALITY AND PRICE OF THIS SWORD . I AM VERY HAPPY WITH IT AND MAY BUY AGAIN FROM TRUE SWORDS . THE ONLY THING ABOUT THIS SWORD I WAS A LITTLE DISAPPOINTED IN WAS THAT I THOUGHT IT SHOULD HAVE BEEN A LITTLE SHARPER THAN IT SEEMS TO BE . THAT IS JUST MY FEELING THOUGH AND OTHER THAN THAT , I THINK IT'S PERFECT . I DO NOT THINK ANYONE CAN GO WRONG ADDING THIS SWORD TO THEIR COLLECTION .. Didn't expect it to come in for months, but someone must love me. It came fast, it came as described, it put a huge smile on my face. I love the way this site handles shipments, I couldn't complain if I tried. Double boxing, and sending everything out as soon as possible? Heck yes. I haven't done much for testing the blades sharpness, strapped on time, sorry. The blade came with absolutely no knicks, etc, it looks amazing. The box it came in isn't the focus, but it still looks nice in my room. The cleaning kit is all in Japanese, which would be a problem to anyone that doesn't have the internet. Feels great, and is obviously a surprise when you pick it up as to how light it is. Would recommend, any day. First I would like to thank TrueSword for their great service and fast delivering even during the winter storm. This sword has been a long buy for me because I wait for the restocking period for over a year. However this sword was worth the wait. The sword is amazing there is no wobble, flapping, or wiggling in the blade. I even held it horizontally and it did not even sway down. The blade is long and the handle is just right for my style. The 1045 steel may seem intimidating but it was water quenching making it flexible and super strong. This sword does not bend easily and would be great for anyone who likes long blades. I highly recommend this sword. The price is just too low not to buy. Also the fitting is great; really tight and sturdy.